The Comets won by a whisper Friday night but the fans were not sure they would. They wondered as the Comets fell behind, should we leave? No, just one more play. The Penn Manor fans were doing a lot of this in the blistering cold during Friday night’s eventual victory against Cedar Crest to win the game 36-35. The Cedar Crest Falcons started the game out tough and continued throughout the game as the Comets kept taking steps backwards with key injuries. Starting quarterback, P.J. Rehm was put on the sidelines after getting a helmet-to-helmet hit and head coach, Todd Mealy, didn’t want to risk his player for the playoffs. home field advantage for their first district playoff game. He entered the game with the score 21-15 in favor of the Falcons. Sahd is only a freshmen, but looked to be fearless on the field as he scrambled and ran right at Cedar Crest defenders. At the start of the fourth quarter, the Falcons were up 35-22, and showed no signs of slowing down as their offense looked to be unstoppable. 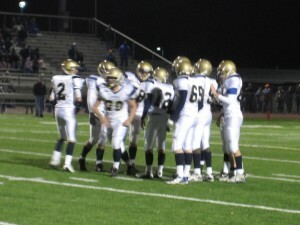 Penn Manor didn’t give the Falcons the chance to slow down they enforced their own rules. LeRon Lee rushed for a touchdown to cut Cedar Crest’s lead to only 6 points with the score 35-29. Making the game close wasn’t the reason the Comets fought so hard in the 4th quarter. They were here to win the game as they did ,thanks to Jarod Shearer’s powerful run, plowing his way through Falcon defenders to tie the game 35-35. Now it was time for Keith Eshlemen to complete the game and just place the ball through the uprights. Eshlemen has seen pressure all throughout his high school career from basketball, soccer and now football. He always seems to come through in pressure situations. Eshlemen had a textbook kick to complete the win and bring the Comets to 8-2. They will now start preparing for the District Three Class AAAA first-round playoff game.